Numerous skin conditions can affect a person at various stages of life. Some of them can be present at the time of birth or develop soon after and are known as birthmarks. Hemangiomas also fall in this category. Hemangiomas occur on the surface of the skin due to an abnormality of blood vessels. There are several types of Hemangioma. In order to counter them, there are treatments available. But before discussing the treatment course for Hemangiomas in Dubai, let’s have a detailed look into what these nevi are, their types and symptoms, and what causes them. Hemangioma Dubai comes from Greek terms “haema” which means blood, “angeio” which means vessel and “oma” which means tumor. Hemangiomas are benign tumors that are formed by the accumulation of blood vessels at one spot in an unnatural manner. Usually, they are present at birth or can form soon after birth, though they can form later in life as well. 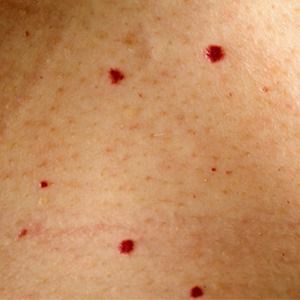 Strawberry Hemangioma: These are spots and patches on the skin that generally have a dark red color, as the name strawberry suggests. Mostly these red patches occur on the neck and face. They can occur at any age but most commonly they occur by birth or just after birth. Capillary Hemangioma: In Capillary Hemangioma, tumors arise in the capillaries (tiny blood vessels). Cavernous Hemangioma: In case of Cavernous Hemangioma, tumors arise in the veins of the vascular system. Compound Hemangiomas: These nevi result from a combination of capillary Hemangioma and cavernous Hemangioma. Arterial or Plexiform Hemangioma: These are the benign tumors that appear in the arteries of the vascular system. Intramuscular Hemangioma: This type of hemangiomas causes tumors present in the tissues of the muscles. Internal organ Hemangioma: As the name suggests, these occur in the internal organs of the body, most commonly in the liver and intestines. Bone Hemangioma: The name is self-explanatory. They occur in the skull or spine and are more common in people having age between 50 and 70. What are the symptoms of Hemangiomas? Most of the hemangiomas fade away with time without needing any special treatment. But if it persists or starts growing in size, it can be treated and the best option is laser treatment. The laser aims to completely remove the lesion or tumor by breaking it down. The process is quite simple and almost similar to Birthmarks Treatment. The procedure is performed on an outpatient basis and takes just a few minutes in its completion. To avoid any potential discomfort, the procedure is performed with local anesthesia. For smaller lesions, even a numbing cream would work. Which laser machine is used? There are many benefits of Hemangiomas treatment. For more information on the Hemangiomas Treatment in Dubai or to schedule a procedure, visit us at Laser Skin Care Clinic in Dubai. You can also benefit from our offer for a free online consultation with our experts by simply filling in the form given below. We also offer Laser Hair Removal and Laser Tattoo Removal. Strawberry Hemangioma on Infants and Children – What Can You Do About Them? I had a hemangioma just behind my right ear. I tried different home remedies but could not get it removed. Then a friend of mine asked me to consult Katrina Valente of Laser Skin Care. She used lasers to burn the benign tumor. It took just 4 sessions of laser treatment before my hemangioma was completely gone. Thank you Katrina Valente, you really are great! I was born with a benign growth on my wrist that bothered me for almost 25 years. I saw different dermatologists to get rid of that irksome growth but they all excused citing different complications. But Katrina Valente accepted the challenge and erased that tumor with lasers in just 5 sessions. Can’t be satisfied more! Birthmarks are always distressing, especially when on face or neck. I also had one on my neck which I always wanted to get rid of and I finally decided to undergo laser treatment earlier this year. Now my neck does not have a slightest mark of the hemangioma. I am extremely satisfied with the services offered. Won’t hesitate to visit the clinic again! You Don't want to Miss Our Offer on Hemangiomas . Fill in The Form To Avail Our Special Offer For You!